Auditing, consulting and structuring – these are the areas of expertise of the FALK group of companies. Today, medium-sized companies are looking for a lot more than classic tax consulting and auditing. In this sector therefore, a top-class accounting company is always a management consulting company too. The FALK Group with its various subsidiaries meets all the requirements of medium-sized companies and can provide the specialized services that are required. Our mission is based on collaborative partnership. We concentrate in detail on the specific issues of our clients, we offer constructive advice and, based on this, we create tailored and clearly formulated solutions. We act holistically to create sustainable benefits for our clients. We manage this with our team of experts made up of auditors, tax advisors, and management consultants and other specialists who are consulted when necessary. Success can only last if we base our actions on our values. Mutual trust and regard, respect for one another, transparent communication, open dialog, and loyal and decent behaviour are the pillars or our corporate culture. We advise our clients as equals and we work with them to develop clear solutions for complex issues. Our greatest assets are always our employees. With the excellent qualifications of our teams, coupled with continued further training, we create the basis to meet all the requirements that are brought about by changing circumstances and conditions, and to deliver top-quality performance. Trust is very important to us. We are aware that trust is the result of a process. We take the time to develop this trust – both externally with our clients and internally by teamwork. Our principle of “open doors” means that we promote communication, direct contact, solidarity, and long-term, trusted collaboration. We work consistently to retain the trust of our clients through our outstanding performance so that we are always a reliable partner. The lasting success of our clients is our motivation – we are committed to it: Every day, every one of us. Our corporate culture is based on employees who live their profession, who love a challenge, who are curious, creative and dynamic. Our goal is to have our clients recognise this and appreciate it. We discuss, we ask questions, we are critical. For us, criticism is always constructive – and is the basis for trusting partnerships. All topics are openly addressed. We act independently but we are never indifferent. Because we act independently, we say what we mean, and we are committed to our judgments. Trusting client relationships are the result of many years of successful collaboration. The continuous support from the responsible partner and our comprehensive, integrated consulting approach, have proven their worth. This includes the promotion and support of young talented people and their training to become competent contact partners, along with the operational activity of our managing partners. We do not act or think in a hierarchical structure but on the basis of professional and personal competency. FALK is one of the largest independent companies in its sector in Germany. With our services in the areas of auditing, tax consulting, and management consulting, and our ten locations in six federal states, we are always close to our clients. Our home is in the Rhein-Neckar metropolitan region with the cities of Heidelberg, Mannheim, Speyer and Heppenheim. Together with our locations in Frankfurt am Main, Karlsruhe and Tauberbischofsheim, our core geographical focus is southwest Germany. However, with offices in Osnabrück, Berlin and Munich, we are also well covered in the North, East and South, and we are always close to our customers. Globalization reached the SME sector and FALK a long time ago. Since 1987, we have been involved with Praxity and its predecessor, the leading global alliance of independent auditing and consulting companies. The over 630 locations in more than 100 countries are act just like our overseas branch offices. Through many joint projects, we have developed personal contacts with many Praxity colleagues. This enables us to provide fast, high-quality answers to cross-border issues and to provide optimal support to international clients. Thanks to Praxity, FALK is extremely well positioned internationally and is ‘at home’ all over the world. 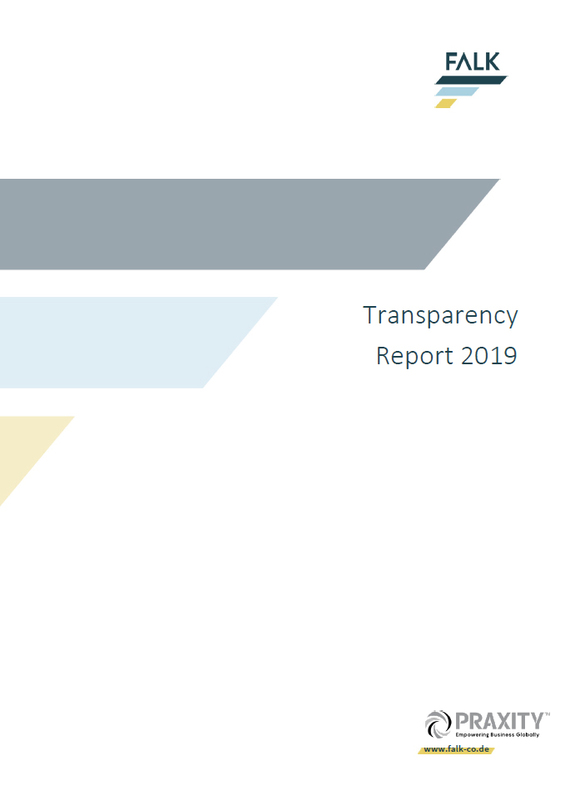 You can download the latest transparency report of FALK here. FALK is an independent auditing and consulting company and is one of the top 20 companies in the sector in Germany. Every year, we carry out final audits at public interest entities. For this reason, we are professionally obliged to publish an annual transparency report. We offer the highest levels of quality to our medium-sized company clients. This report shows, on the one hand, how we maintain this quality in the area of auditing and audit-related consulting, and how we retain our independence. On the other hand, it provides information on our company and service structure and on our turnover. For previous years, the transparency reports are available under publications. As auditors and tax consultants, we constantly assume responsibility for our clients. We also gladly meet our responsibilities for our own company. We are acutely aware of our responsibilities to the environment and the broader social impact of our business. We actively ensure that our work on social and environmental issues helps build a better society for all. . Our employees teach and lecture young academics at universities and other institutions of higher education. We are also involved in social, ecclesiastical and scientific institutions in our locations.